We LOVE Pad Thai. Just can't get enough of this stuff! In Hawaii, we had a small little Thai restaurant on the next block that was out of this world! The owners were extremely pleasant, and the intricate carved wooden art on the wall was candy for my eyes! Since then, we compare all Thai food back to that little restaurant... until now. 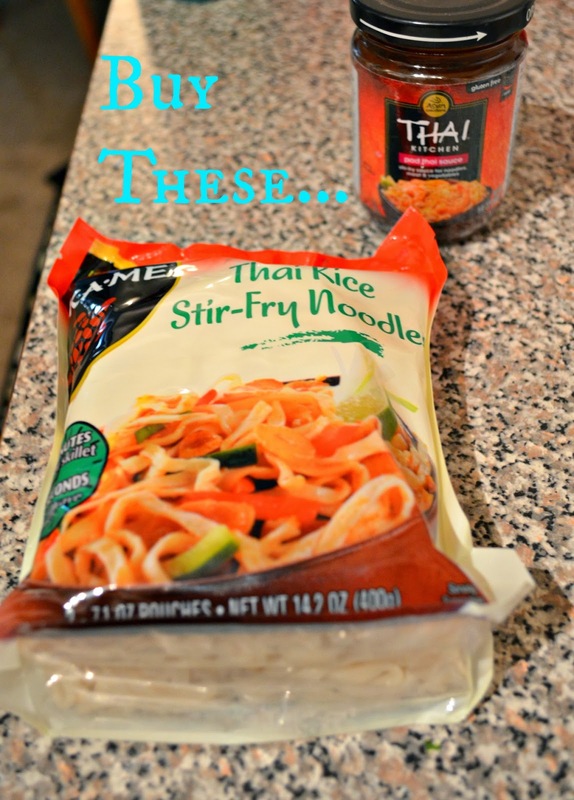 I found the easiest way to make this and it actually tastes authentic! If you think you can't cook to save your life, check this out and wow your guests next time! So, pretty much you buy the correct stuff, normally in the "Asian" section of your grocer. I think this brand is Asian Creations, Thai Kitchen. OK, so you buy the pre-cooked rice stir-fry noodles (don't know what they will actually be called if it's not this Asian Creation brand, so just look for all of those words that are underlined). Then you get the pad Thai sauce in the little jar, and chicken breasts! 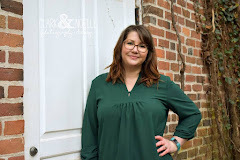 I added extra things in mine, you don't have to do it if you don't want to, but if you do- at the bottom of this post is the official looking recipe. Get out a pan and put it on med-high heat, add 1 tbsp. of olive or vegetable oil to it, and you're going to add an egg and scramble until set. Don't over cook it! And remove from skillet. Then you take your pound of boneless, skinless chicken breasts, cube them, add another tablespoon of olive oil to a pan and keep on med-high heat. I add salt and red pepper to the pot at this point, but you can add black pepper if you wish. I like things SPICAYYY!! Optional: If you want to add the swanky items in there, you can purchase bean sprouts, rinse them thoroughly, and add about a handful. I also cut up green onions and cilantro, about half a handful of those. Once the chicken is cooked until no longer pink in the middle, you pour in everything you have- noodles, egg, and the optionals. Another optional: I added juice from a lime, just to give it another layer of flavor! Then gobble this up because it's delicious! It's basically cooking the chicken, and if you can do that, you can do this recipe. Minds will be blown here, my friends! Heat up 1 tbsp. of oil in large skillet or wok on medium high heat. Add egg; scramble until set. Remove from skillet. Add remaining 1 Tbsp. oil to skillet. Add chicken; stir fry until cooked through. Add noodles, Pad Thai sauce, and green onions; stir fry 3 to 4 minutes or until noodles are tender. Stir in bean sprouts and scrambled egg. Place noodle mixture on serving platter. Sprinkle with peanuts, serve with cilantro sprigs and lime wedge. You can also substitute chicken for peeled shrimp or cut up veggies, or even cubed tofu! Tell me some of your easiest recipes! Comment below! YUM! Looks so good! Can you believe I've never had pad thai? I didn't even know what it was until just recently, I need to try it soon! I forgot how much I live pad Thai until just now. No good Thai places where I live! I will definitely make this and I'll eat it all if my family doesn't like it!!! This looks really delicious and I don't think it's something I've ever tried! Adam LOVES pad thai- he makes it a lot at home. He always uses uncooked noodles, I wonder if he knows about these! 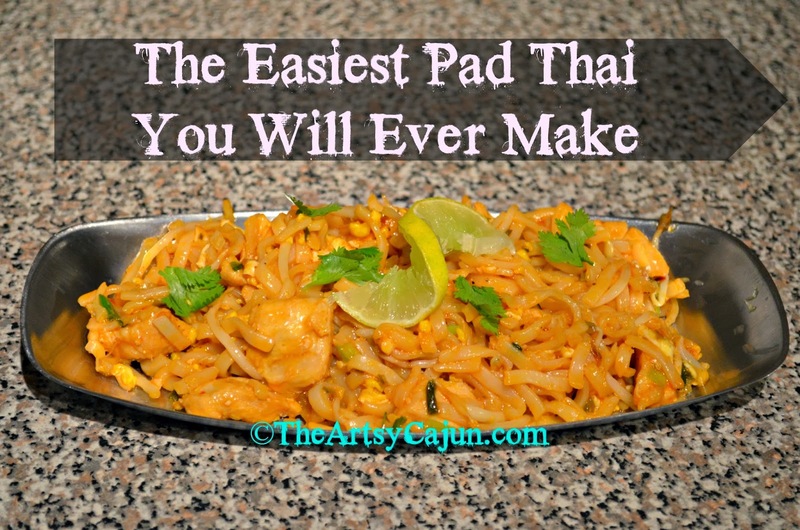 I've never had pad thai--but this really looks delicious! Sounds delicious! I love pad thai! I will have to try this! And funny that you mention it, but we have a favorite Indian restaurant in Hawaii and we compare all the Indian places to it! I agree, this does sound doable! Thanks so much for the recipe!